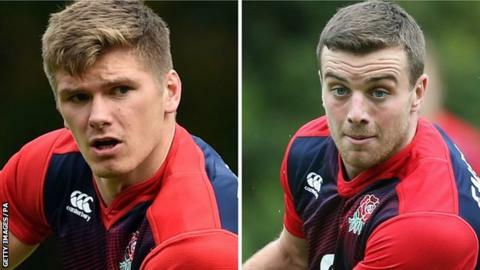 England fly-half George Ford will be dropped for the World Cup Pool A match against Wales on Saturday, with Owen Farrell replacing him. With injured centre Jonathan Joseph missing the game at Twickenham, rugby league convert Sam Burgess is set to start alongside Brad Barritt. Burgess, 26, will be winning only his third England cap. Number eight Ben Morgan is also set to miss the match because of a minor knee injury, with Billy Vunipola coming in. Morgan, 26, broke his leg in January, ruling him out of the Six Nations, but returned to regain his starting place ahead of Vunipola for England's tournament opener. Wasps flanker James Haskell will step up to the bench to face Wales. Bath centre Joseph, 24, injured his chest as the hosts beat Fiji 35-11 on Friday. England attack coach Andy Farrell said Joseph's injury was "nothing too serious" and would probably keep him out for "not more than a week", although it is understood he is a significant doubt for the match with Australia on 3 October. Joseph scored four tries in England's Six Nations campaign earlier this year and is one of the most dangerous runners in England's backline. After facing Wales, England play Australia, followed by Uruguay on 10 October, with the top two teams from the group progressing to the quarter-finals.